The USB broadband modem from Safaricom simply plugs into your PC or laptop’s USB port, loads the necessary drivers and creates a connection to the Safaricom network. Obviously you shall have inserted the SIM card (with data services enabled) into the modem. You must call Safaricom customer care for this to be done. So long as there is network coverage, you shall be online. Safaricom charges you KES 12.60 per megabyte of data transferred. Details on the pricing and terms are available here. They have various offers currently running for both pre-paid and post-paid plans.The beauty of this setup is that you are able to go online from virtually any place in the country where there is coverage. As more entrants come into the market, there is going to be a bruising battle for data services. France Telecom’s Orange brand is expected to hit the market in a couple of months and they are positioning for bundled services. Details shall emerge soon. Econet Wireless is also setting up infrastructure to being the battle in the near future. I wound kindly request you to assist me on how i can connect to the safaricom broad bad for commercial purpose.my business is situated at Thindigua along Nairobi Kimbu Road,it’s a cyber cafe. Once you have the USB broadband modem, you should also get a SIM card enabled for data (this is usually done at the shop). Take this back to your cyber cafe and create the connection on one of the PCs / or server (if you have one). Then this can be shared by the other PCs in your cyber. Go to my contact page and send me an email for more assistance. I’m glad you are covering the broadband scene. While Safaricom’s offering could be said to be excellent at this time I really don’t see how they’ll hold up against Celtel’s unlimited service at 2,999/mo with 3G expected before or in August. I suppose they’ll launch an unlimited plan like they did with the Blackberry. BTW, I am really impressed by your keen replies to reader questions in the posts! Bookmarked! Firstly, Safaricom cannot be trusted with RELIABLE service. I use Celtel’s Uhuru Net Internet Access that gives you unlimited Internet for Ksh 2995 a month. The connection is EDGE, at 236.8 kbps. It is quite reliable, though not broadband. My fear is Safaricom’s numerous connection glitches. Unless someone confirms that there is no congestion whatsoever. Safaricom’s 700 MB cap is a raw deal. Sometimes, you download over 100 MB (remember you gat charged for both upload and download). If you forget to turn off Windows Automatic Updates, you are so screwed. Before long, your bill nears Ksh 5000. The additional charge happens to be Ksh 12.60 per MB. Celtel’s is a constant Ksh 2995 per month. You can then use internet all you want. All day, every day. Problem is Celtel’s poor marketing of their services. Methinks their Internet Service is both superior (reliability-wise) and affordable. Thanks Murithi! My blog lives for user comments. Am soon migrating to a permanent home and we shall lots of fun and interaction on this blog. I agree with your comments on Celtel’s foray into Internet for all. I recently went to their shop to buy the same and they couldn’t sign me up since I did not have my PIN certificate copy (lesson, scan all the relevant docs and keep copies online, in Kenya you will always be asked for them). Anyway, price wise and clarity wise, they are thrashing Safaricom. BUT, they are not selling the solution as aggressively as I would want them to. Safaricom is screaming its head off and people are buying. Go to Sarit Center and visit the two shops. I would have thought, Celtel (now owned by Zain — formerly MTC — of Kuwait), has very deep pockets and should be fighting seriously for the share of the pie. But wait till Econet and France Telecom’s Orange roll out by year end. We shall be laughing all the way to the net! Murithi, keep up the spirit! Thanks Peter! I agree, nothing is worse than download caps. You could easily hit your cap in a single day. Celtel need to make alot of noise, whats all this about fearing to market your good services, I don’t get it. The future is bundles, and with what France Telecom are planning for Orange, their GSM brand, we are going to have lots of fun as subscribers. We can only wait. My gripe with Safaricom, like every one else, is customer disservice and customer scare (yes, they do not have customer service). I think we Kenyans are a peculiar lot, we tend to gravitate towards the people who mistreat us most (think politicians and Safaricom). It’s very difficult to get simple things done at Safaricom. Anyway, they don’t need us, they have millions of customers…. but I digress. Celtel’s offer is great, no cap for 2995. Couldn’t be better. The beauty of it is that I can go to my village and surf away next to the cowshed. I am signing up soon as I can get round to going to their shop. Once 3G kicks in, we shall be riding the wave smoothly. More importantly, what we need is serious competition. The mobile networks advantage is reach …. they are every where, and the other ISPs must envy this alot. Once Econet and France Telecom’s Orange hit the market, expect prices to go south while services and their delivery go north. They had better. I long for the day we shall have MNP (Mobile Number Portability), and I can hop from network to network, without fear or favour. But thats a story for another day. Both Safaricom and Celtel (soon to be Zain) charge for the content uploaded or downloaded. Visit the Safaricom site for details. Celtel’s details are here. It’s debatable on who is cheaper. My major concern would be quality, availability and reliability of service. Then I would have no problem paying for it. A careful analysis shows that Celtlel Unlimited is a better package (you pay, 2995/-) and there is no cap on the data downloaded or uploaded. To me this is good for planning and budgeting. Safaricom’s major selling point is 3G network which has higher data speeds, but then its only available in select areas, mostly Nairobi. Out there the connection is GPRS/EDGE (same as what Celtel have). Their bundles are not good, and you end up being forced to upgrade to the next bundle, clever marketing. Celtel are also working on their 3G network. I await the entry of Econet and Orange to the Kenyan market, and we should see a drop in data connection costs, thanks to competition. Keep reading JLO, soon internet connection will be available and affordable for all, its what we do with it that will matter. A 3G enabled device enables you to achieve better and improved service e.g. when accessing internet, you can access up to 7.2Mbps downlink speeds as compared to other technologies which offer up to 236 kbps that is EDGE- 236Kbps/GPRS-40Kbps. It’s all about speed and reliability of service. Safaricom are doing a good job out there, one can say that its within Nairobi but as per their plans( Safaricom Ltd) it will be rolled out to the rest of the country, all ready Mombasa is a Safaricom hotspot too. within Nairobi you’ve got to know the hotspots so as to get better services at superior speeds thus reducing the cost associated with slow service. so lets use wat is available and not wait for celtel coz its all about business and who implemented the services first. It seems this debate is getting more interesting. The battle for supremacy shall be won by the one who prepares well to fight for customers. Safaricom have first mover advantage, are very serious about their marketing campaigns. Celtel have a better quality product (though not 3G), are sluggish in marketing, and thus the customers may not be queueing in their shops. NB: I don’t know if their intended re-branding to Zain will make the waters more murky. Perception is also important. Safarciom have an edge on this as well. Irrespective of their service and many network glithces, they still perceived as the market leaders, and that is important. Now, about the speeds, the connection of 7.2Mbps is the connection speed between your 3G device and the base station. It is a theoretical maximum. Beyond that its anyones guess as to what actual throughput you get from your connection. Obviously since this is shared bandwidth, your throughput is dependent on who else is online, distance of the user from cell, whether the user is moving or stationary, network operator capacity and network optimization requirements. This means those tests they do at the retail shop to show you how 3G is screaming fast, may not be the same when you reach your house. Ofcourse, the network provider will always talk about the 7.2Mbps, since its a nice figure to bandy about. As they say, the true test of the pudding is in the eating. ooh i forgot to ask. does safcom charge u per month or after your bundle is exhausted irregardless of tym? and the start up charges i ddnt mention r as follows- safcom 12k, celtel 13k n popote wireless a whopping 27k. Your enthusiasm is infectious. Since you are jumping into big league (forex trading) you should get an always-on connection with guaranteed bandwidth. See AccessKenya’s access@home offer. • Guaranteed Bandwidth = Fast, dedicated speeds. • 24/7/365 Customer Support = get help at your convenience. • Unlimited Data Downloads = download anything you wish with no extra charges. • Fixed Monthly Fee = affordability and value for money. •AccessKenya Product = providing you with a quality, reliable, trustworthy solution for your home. • Access@Home = improves your lifestyle. Equipment – FREE of charge* (Normal retail price is Kshs.25,000/-) One off Installation – Kshs.8,500/- plus VAT Fixed Monthly Fee – Kshs.6,000/- plus VAT Guaranteed Speeds – All Day (7am – 6pm): 32kbps Uplink, 32kbps Downlink & All Night: 64kbps Uplink, 256kbps Downlink & All Weekends (1pm onwards – rest of the weekend): 64kbps Uplink, 256kbps Downlink. Equipment – FREE of charge* (Normal retail price is Kshs.25,000/-) One off Installation – Kshs.8,500/- plus VAT Fixed Monthly Fee – Kshs.4,000/- plus VAT Guaranteed Speeds – All Day (7am – 6pm): 32kbps Uplink, 32kbps Downlink & All Night: 64kbps Uplink, 1286kbps Downlink & All Weekends (1pm onwards – rest of the weekend): 64kbps Uplink, 128kbps Downlink. Hit me back with your thoughts. With Safaricom bundles, once you exhaust the download/upload cap, the connection reverts to the unbundled tariff cost Kshs 8 per MB. It’s not time based, but purely as per the bundle you sign up for. Read my earlier comments on the much-talked about 7.2Mbps speeds on the 3G network. Thnx mr karugi. i ddnt know access catered for home clients al definitely put them on my list. the thing is i wanted to start with an affordable n reliable internet provider then as my trading picks up –read profits– al change to a more fast n guaranteed package. so according to what av read on ur blog, i was thinkin maybe celtel da first few months coz compared to access@home, it has faster speeds i.e 236kbps compared access max of 128kbps. am on my way to celtel head office ryt now -its a walking distance frm home- al tell u what av found out. P.S popote wireless n wananchi online hv an expensive package n nt so fast internet. I agree with your strategy. Start with non-contract connections, and work your way up the food chain. Better timea are coming from Econet, Orange (read Telkom Kenya), Zain and other players. The Kenyan data services field will never be the same again. We can only wait….but like I have said before, it is what we shall do with the connections once we have them. That’s what is important. Am happy when you trouble me with issues. Thats why I blog. Check this page for all the details on the Safaricom 3G bundles. The answer to your question. FAQ – How do I check the Balance of my Free MB? Also note that the download is not really time based. Its not an exact science where you divide the advertised speed of 7.2Mbps versus the cap of 5GB. In essence, 7.2Mbps is the connection between your phone/modem and the base station. What happens after that is quite complex, and nobody can tell you for sure, not even Safaricom. In their own words “speed of connection is determined by a number of factors like available bandwidth, number of users within the same cell, level of voice usage within the same sector, the response time of the site you are viewing e.t.c.” This means your actual throughput will vary from time to time. They stick to the story of 7.2Mbps, which is nice and sweet, it’s called sales pitch. For the 7K they are charging you for a cap of 5GB, you can get a better deal elsewhere, without any caps. In this day and time, you should enjoy unlimited access, period. If 3G means caps, am not interested. Again, ignore the advertised speeds. I would still advise on a reliable, always-on connection with no caps. You only worry about the next bill, while your forex tickers run 24-7. This is real great mr.Karugi! Knowin how we are coned n are still acceptin it is really being kenyan! Sorry,the short code was 446. Thanks 17-Year-Old-Geek?? I like the name. We need more informed Kenyans like you to help our peculiar brothers and sisters navigate the treacherous waters that are technology related. Yes, a 3G enabled phone will do the same job as the USB modem. Go to GSMArena and search for details of the phones that are 3G capable. Pros and cons? The data rates should be the same whether you use the modem or the phone. The whole idea is what do you get for what you pay. More importantly, what will you do with the Internet connection. That’s the big question. Hi. This is a really nice blog you got here. This goes to those thinking of using safaricom 3G on their phones. Most 3g phones come equipped with UMTS a 3g standard with speeds reaching a theoretical 384 kbps. On the other hand to get faster speeds look for one with HSDPA Which is 3.5g which promises a theoretical 7.2 mbps but most available phones can achieve only 3.6 mbps but faster phones are available for those willing to dig deeper in there pockets. With all this promises of lightening speeds safaricom have opted not to tell you that they have a cap on the effective download speeds you can get, simply because international internet connectivity in kenya is too expensive. When it comes to speeds and service outages safaricom is best choice but if you want reliable thou bit slower and affordale connectivity Zain is the way to go. Make a wise choice. I agree about the choice of what to use. Remember the advertised speeds are just the ideal connection speeds which never happen in real life. I would go for reliability than speed with uncertainities. Let’s choose wisely. Again thanks! I do concur with Buju. Most 3G phones use the UMTS standard, with theoretical speed limits of 384kbps. Only HSDPA devices e.g. the Huawei USB modem and 3.5G phones e.g. Nokia N95 can give you true 3G speed. But then again, all this is theoretical. Your speed will always be lower than what they advertise. Safaricom – sorry, Suffericom wants you to dive into using its services without looking. I still insist Zain is the way to go for now. I have reliable info they are almost going 3G, (their approach will be countrywide rollout). hi. may i just say thanx for your blog. the info available here is really useful. i hd intended to buy zains usb modem with their 2990/- monthly charge so that i can use the conn for high level online gaming at home. I had mistakenly assumed upon seeing the ad for the uhuru unlimited internet conn that depicted a gal using a usb modem similar to that of bambanet only that it had a celtel logo brand, tht it used 3g which is synonimous with highspeed internet. By the way, if i bought a zain usb modem can i use it with a safcom data enabled line or is the device programmed to use onlu zains network? I am not sure if the USB modems are SIM-locked to the network provider. Their customer care people will not tell you of course. You can still buy a network-neutral modem from reputable telecoms shops and it wont matter which network you sign up for. High level online gaming? I don’t know if the bandwidth will be sufficient, am not into gaming. But hey, keep commenting and reading, and I will keep posting. We need to fully undertand the difference between what is sold as bandwidth and the actual througput of a connection. Then we shall make informed decisions. Hi all. I just want to clarify something about mobile broadband. There are two major technologies out there. Gsm and Cdma with the latter being superior because of efficient utilization of the frequency. Gsm has its pros but they had to borrow a leaf from cdma with there hsdpa technology which competes with EVDO (evolution data optimised) on the cdma arena. Both of this have very promising downlinks in terms of mbs but when it comes to uplink they fail terribly with peak of up to 384kbps on hsdpa and equivalent on EVDO. So when it comes to gaming they are not the best options because of their unsymmetrical nature. My gaming friend you will have to wait for hspa (high speed packet access) with uplink speeds of 1.8 mbps and EVDO rev b for cdma. Let me not discourage anyone from trying the services, i use Zain’s edge and its works for me though i would wish they had their 3.5 G running. All in all we have come a long way from dial up to cybers now we are seated in our homes things will become better. I forgot to mention that if you have a suffericom huawei modem it only works with their sim cards same for Zain. If you want you can try flashing the firmware to accept all networks. Of cause you will be doing this at your own risk. Can Somebody help me on this please.I bought the safcoms 3g huawei modem for about KES11k somedays ago and i have been browsing till juzi when the thing suddenly could not work.Everytime i tried to open an url page,it brings the message the page cannot be displayed.Despite having topped up,it still canot work.Have tried talking to their customer care guys(after numerous trials ofcourse) who unfortunately dont seem to know the operations of this modem but to no vail.I checked the balance by sending an sms to 450 and it replied saying i have 0MB. What can be the cause and how can i regain the MB? Hi Boniface. I dont really use safaricom but i read that if yo on prepaid you need to request what bundle you want. I think you send to short code 446 for 300 mb, 447 for 700, 448 for 1gb i think its a blank message. Try that out. Let me know if it works. Hi guys. I dont know if am the only one who has noticed a new KEN 07 operator when you manually search for available network operators. Do we have a fifth gsm operator coming up because the last time i checked we had Orange and Econet in the pipeline? This post is really generating the right debate. How I wish the nabobs at Safaricom could read this, usually they don’t. We are doing them a favour. Boniface: You must demand your rights for service and clarification of what you purchased, there is no shortcut. Today 02/09 Safaricom say they are investing a whooping KES. 1bn to enhance their Customer Scare, sorry Care. Let them get the small things right first, that is what matters. Then they can splash a couple of billions. Buju: Am told KE 07 is the MNC (Mobile Network Code) for Orange. Safaricom is KE-02, Zain is KE-03. Actually the MNC is a combination of Mobile Country Code (MCC) and Mobile Network Code (MNC), also known as a “MCC/MNC tuple”. Kenya’s MNC=639, hence Orange 639-07, Safaricom 639-02, Zain 639-03. This is what uniquely identifies your GSM network globally. Competition is coming, lets wait and embrace it! The MB volume for each bundle is the amount of free bytes that one gets when they subscribe to that particular bundle. Once the free bytes are exhausted, the line does not stop working. Instead one is charged at the normal cost of ksh 8.00 per MB. Have been promised my problem is being looked into.Am really pissed off with this safcom broadband modem!Am just thinking of reverting to my previous modem from Telkom wireless which though is expensive but was atleast reliable!Was told telkom was to roll out their EVDO soon!Anybody has any News on this? Well Boniface, i would advice you to try Zain edge which they are soon to upgrade to 3g. Since you already have the huawei modem look for firmware that allows it accept any sim card then you can try Zain’s edge. About EVDO on telkom, i read on their website that you buy the modem for about 10k. I agree with Buju on Zain edge. My only hope is that their 3G rollout will be get beyond Nairobi and Mombasa faster than has been the case with Safaricom 3G. Well, demand is surely getting hotter on the internet scene in Kenya. I used to study, till May this year, in India where i remember paying Rs 350/month (KES 500) per month for unlimited EDGE internet access on my phone. Broadband, infact, was cheaper with companies offering speeds of 256 Kbps at Rs 250/month (KES 400). However, my university did not allow fixed line ADSL connections into hostels so i had to use the EDGE connection on my mobile. Plus, there was always a really wide range of options – as a result of around 5 broadband providers in the region. And with regards to corporate connections, have any of you guys seen the pricing structure out there!!! companies pay as much as USD 1200 for a dedicated 512Kbps connection! Lets hope the fibre link next year brings some light into the darkness. BTW, right now am using my cell phone to access the internet – Zain. Zain has its cons – a topic that has not cropped up so far in this dicussion. 236 Kbps is shared. I am not aware of the sharing ratio but i believe its pretty high. Thats coz i run speed tests sometimes and i never even touch 56Kbps. Hope Zain comes up with a good pricing structure for its 3G network – if any is in the line. P.S – I still remember going into a shanty cyber cafe in South B in my Form 1 Days – 2001. I remember having paid a precious 100 bob note, which BTW used to be my pocket money for a week, for 20 minutes of browsing. DAMN!! I have used Internet access in India and they are light years ahead. In Kenya I guess its a chicken and egg scenario. For the prices to come down and the bandwidth on offer to be increased, there has to be a critical mass of customers. For the critical mass of customers to sign up, the bandwidth on offer has to be high, and the prices low. I have yet to see a retail connection that is not shared. Only corporates @ US$2500 per month (yes, that is about KES.175,000) enjoy dedicated bandwidth of about 1,024kbps, and that is FAST! Zain’s offer is still attractive to most retail customers. Read the details of Zain pricing here, its quite complicated even for me. Buying a 3G modem from the shops is good idea, since you can just slot in your SIM from whichever provider and surf away. What’s important is knowing EXACTLY how much its costing you. Deciphering cost structures is quite complex. How for example do they measure 1MB of data? Hi! Well i have been doing research on this hsdpa modems and what i can say is that both the Zain and safaricom have subsidized the prices at the cost of locking you to their network. On average it will cost you about 14k for the open modem of the shop but before buying it check if you can get a way to unlock the modem like we do to phones. Its a huawei e220 modem and the whole package from Zain costs 5995k for the modem and 5k for connection which is refundable after the contract. Total is 11k then the 3k and you add 16% vat for monthly charge. If you cant unlock the modem go for the open one coz i read Econet want to start with their own 3g network hopefully hsdpa not wimax and the orange will follow suite now that they are to start commercial operation today. The future is bright guys. Buying an unlocked 3G capable modem is wise, since 3G networks are coming soon, from Zain and Econet, and hopefully Telkom GSM. I hope by now the operators understand that we are hungry for good quality high-speed mobile data networks. I still dream of broadband from my balcony, without having to sell half my assets to pay for the connection. hi guys, im based in uk but follow with a lot of interest your blog. my family are in nairobi but unable to get online, sigh! they have all necessary equipment, laptop, 3g handsets such as nokia 6280 and even bought the huawei modem from safaricom but still no joy. as i am all the way out here, it is not easy for me to assist them. anyone of you who could possibly help please? Orange have finally launched and nowhere in the ads do i see internet access pricing/speeds/technology. I hear that Orange in the process of providing broadband access to homes through their fixed line network. I wonder how that is gonna work out considering the fact that 15 days every month their lines are down…. Hoping for good connectivity when Econet launch…. The cheapest offer available is for 6K per month. 256/128Kbps. But i bet that it is a shared connection. Too bad for those waiting for Zain’s 3g network like me. Mr Meza said they are not planning to switch to 3g as yet. Safaricom 3g is really expensive as it costs me 1k a day doing some work online and its basic browsing on downloading movies or softwares. We might as well wait for Econet and see what 3g offers they have for us. Bwana this blog is the shi…Keep us informed guys! I’ve found out more by checking it out rather than going to the shops.Some of those fools who man them deserve to be shot!They don’t have a clue! I have a solution for anyone with a sim locked or network locked modem. Kindly get in touch on jaguar373@gmail.com. I have a solution for anyone with a sim locked or network locked huawei E220 modem. Kindly get in touch on jaguar373@gmail.com. I am overwhelmed by the comments this post has elicited so far. It has become a very lively forum, just based on one post. I will keep my eyes peeled for more interesting happenings in the mobile industry. holla @yo’ boy. I also have something very useful. Share your knowledge and expertise with others, and all shall be knowledgeable. Hit me back on my personal email, am super curious. this blog post has just saved me hours of searchin for the perfect internet provider. I will definitely go for zains unlimited package. knw to follow which route to where food was? yep the food is my airtime…And ofcos suffericom is that hyena…cant bliv they havent reduced calling rates…2.50 saa sita usiku kwani ni offer kwa wachawi ama night-runners? Yeah saf must have guys looking for such info about hacking their sys. But u can point us in the right directing through our emails. This internet, 3G, Safaricom, Zain stuff really has got people talking. Very interesting comments here. At last i did get the Econet signal in some parts of the cbda. Places were orange network is not available. I dont know whats wrong with MJ’s network calling it from Zain is always an issue. I thought it was Zain restricting calls but after trying to use orange to call it i got the same problem, worse still smses from orange to sufferincon are failing. I wonder what cck is doing about it. Sometimes back i asked for help on using my safcom 3g huawei e220 modem(hotspot) where i could not browse with it on my pc,but now iam able to after several attempts and trying to know where the problem could be.I tried by installing the modem on other pcs and surprisingly,it worked well.On closer look at my pc i noticed that once i connected to the modem ready to browse,sygate firewall blocked urls i attempted to connect until i exit from the sygate program.Is there explaination for this? ?Could there be possibilty that the safcom modem and its drivers/utilities are seen by the sygate program as adware/trojan thus its blockage?? Wow Hongera wakenya this is very interesting debate in deed and i am glad that Kenyans are really yearning for the best services for their money, this is good and much info is in here for anyone who really wonna make good decission on which provider to have. I have tasted the servies of both Safcom 3G and Zains Uhuru. I must say that the 3G of Safaricom is supa in Nairobi and Mombasa the speeds are really gud but you pay dearly for it unlike the Zains Uhuru net. Though Uhuru net is very cheap and i am sure the cheapest in the market its really the most slowest in deed i don’t know how they do it but the speeds you guys talk about here are just in their website but not a reality at all its Damn slow.When i called them on this issue the answer was that they only dedicate 20% of their network resources for data. I hardly have youtube videos downloaded and its frustrating indeed. Facebook is too heavy for it and Skype is hell. But all in all i still stick to it since its the pocket friendly and gives me unlimited connections 24/7. mr. karugi i can clearly see your blog is still way beyond cool!! JALUO am also using zain modem and damn is it slow! (nowadays) but it gets my work done so i aint complaining…….alot. So wananchi online have the new zuku thing through wimax…….and i dont know what wimax is. can anyone help? tofauti ya wimax, 3g broadband, edge ni nini? which one is better? Thanks all for this vibrant comment forum! Am overwhelmed by your support. As we seek to educate each other on the goings in the technology world, and as we take the battle to the streets, let us enjoy ourselves. And we should also jealously guard our shillings from lousy service providers. -then click on Qos packet scheduler. on the main window u will see a bunch of settings including one saying “limit reservable bandwidth”. double click it and click “enabled”. this is where u override the thing by typing 0 (zero) on the bandwidth limit box…….click apply then ok and you’re done!! you must restart your computer for the changes to take effect. WOW THIS SITE IS ONE HELL OF AN INFORMATIVE ENCYCLOPEDIA! !I USE ZAIN E220 MODEM AND THE UHURUNET THING FOR MY INTERNET AT EGERTON UNI,NJORO CAMPO.IT AINT BAD,EXCEPT THE SPEEDS GET A LITTLE TOO LOW BTWN 2.00PM-10.00PM,BUT WITH PATIENCE I DOWNLOAD MY LINUX DVD`S E.G LINUX MANDRIVA 2009…ANYONE INTRESTED?NOW TWO QUESTions;1.IN ABOUT 3WKS(AT 220MB A NYTE).NOW TWO QUESTions;1.HOW CAN I MINIMIZE THE BANDWIDTH RESTRICTION THING? AND 2. HOLY SIR DEEWINC PLIZ SHARE THE SAFCOM NETWORK HACK KNOWLEGE WITH ME,E-MAIL;shekeine@yahoo.com. ALSO AVAILABLE;.OTHER LINUX DISTRIBUTIONS EG.UBUNTU. LINUX MANDRIVA 2009 DVD(*86_64) SHALL AVAILABLE BY 20TH/NOV/2008. PRESIDENT OBAMA IS HERE,CHANGE IS HERE,THE GLORY AND BEAUTY OF LINUX IS HERE. Hello to all linux peopple out there,longlive sudo,hope U R all doin gud,mind not the windows lot,just BE happy that linux is now catchin up with them real fast and with time we shall cure all and sundry of this windows sickness. 1)When does it actually arrive? 2)How exactly is it going to impact on Safcom and Zain internet SERVICES? 3)When Is this impact going to be felt in terms of internet speeds? 4)And finally,in the name of Lineus Torvalds,WHEN IS ZAIN UPGRADING TO 3G?????? did the 20% thing help out anyone?? and for those of tou who have download issues, google this word…….ORBIT DOWNLOADER. Hi there everyone on mwenedanet.Well am sorry to say that the 20% thing doesnt help anything,at least it didnt work on me.Well am not too sure of what zain 3g would spell for us but judging from the market status,i think its unlikely that we will have to pay more;safcom is in already,and orange are on their way too.All am asking is;when is ZAin bringing us 3G?? ?oh and someone please reply to my NOV 6TH post. 2)Safaricom / Zain services impact? The last mile will still be over the GSM network, so if the providers have 3G, and there is FOC for international gateways, then theoretically the price per MB should come down. I will be looking for better last mile connection e.g. Wimax or FTTH (fibre-to-the-home) once the cable lands. 3)Impact on internet speeds? It is up to the last mile service providers to buy the almost limitless bandwidth, and resell it to you and I. In theory we should “feel” the change in about a year’s time after the ISPs are done with setting up last mile connections. Speeds of 256kbps and more will the norm in your average house. Watch out of Wimax networks and FTTH, though. 4)Zain going 3G? Dunno, its up to them. Most important….what will you be using the high speed internet access for? Start positioning yourself now. Linux people I once again salute you all,in sudo I believe. Thanks alot Prof.karugi(that means that I accord you the same honour as our dons here at Egerton)for answering my querries.Seems like high speed internet is still some far way off,so brothers and sisters;if any,be patient and tame thy thirst and lust of highspeed internet. Now you ask about what am going to do with highspeed internet?Well currently I take the trouble to download my linux DVD`s ,but it takes upto 25 days for 4.3gb`s,see what I mean? Hi guys i was listening to Mr Meza a wil ago and he said they were importing 3G equipment which should be installed this month. He said it was as result of network congestion which i just occurs after 10pm. I hope he will live up to his words. So the wait may be almost over lets wait and see. I just have one humble request for everyone on mwendanet,Why in the name of Linus Torvalds,are we still using Windows in a world full of free,virus immune,overresourced Linux systems?Imagine an operating system that comes with support for any possible hardware combination on your system,a one time less than 40minutes installation that installs network tools,DVD/CD burning software,bluetooth software,an office suite,browsers,download managers,media players(all that software you install one by one in windows)+all/almost any software for any standard/advanced desktop user,all hardware drivers and ETC too;kila kitu!! Oh and by the way are there any ladies here?just asking guys,got an assignment from my biostatistics Prof. and I need that info by the end of this week. Johnny. People, no actually Kenyans in particular are scared of change. that’s why they stick to the things they already know to survive…..key word being “survive”, and not to evolve. that’s why everyone with a computer will stick to the old microsoft that they know, and not move to linux. Hey guys,i just landed on this blog and was really impressed with what’s happening in this blog. I would like deewinc and jaluo to contact me about the free suffericom net connection and unlocking the Zain modem coz i have tried to use safs simcard and it says no sim detected yet i have already flashed the original firmware and dashboard from zain. contact me on tcansol@yahoo.com. Thank you for sharing your info. Hey guys,i just landed on this blog and was really impressed with what’s happening in this blog. I would like deewinc and jaluo to contact me about the free suffericom net connection and unlocking the Zain modem coz i have tried to use safs simcard and it says no sim detected yet i have already flashed the original firmware and dashboard from zain. contact me on nlumala@gmail.com. Thank you for sharing your info. Please Johnny how can i get the Linux Software and how much does it cost? within Nairobi/Nakuru OR you can manage to arrange for a rendezvous in Nairobi/Nakuru. a)THE DVD`S AND CD`S COME PACKAGED AND LABELLED ACCORDINGLY. b)THE DISTRIBUTIONS ALSO COME ALONG WITH PROPER DOCUMENTATION,HELP FILES,SOFTWARE GUIDES AND “HOW TO” FILES ON A SEPARATE CD(IN PDF FORMAT). b)THE DISTRIBUTIONS ALSO COME ALONG WITH PROPER DOCUMENTATION,HELP FILES,SOFTWARE GUIDES AND “HOW TO” FILES ON A SEPARATE CD(IN PDF FORMAT)TO ENABLE YOU NAVIGATE THROUGH AND MASTER ALL THE ENTIRE CONTENT. zain internet is now officially the worst in the world!! I did a speed test at “testmy.net” and do you know what the results were? 6kb/s!!! six! as in S I X!!!!!!!!!!!!!!!! Even mobile phones with GPRS/EDGE do 30 something kb/s. i personally went to their head office at msa road and they admitted that they do have a problem BUT they are rolling out 3G sometime January. as if that’s supposed to make me feel better. i have a mind to report them to the CCK. i know my consumer rights damnit!! WELL WELL WELL, I HAPPEN TO MOST SOBERLY AND MOST CERTAINLY AGREE WITH YOU,HERE WE TALK ABOUT COMRADE POWER,OUT THERE ITS DIFFERENT,TALK ABOUT CONSUMER POWER IN THIS CASE.WHAT RENE MEZA OUGHT TO KNOW THAT A DAY COMES WHEN THE CONTRACT ENDS AND ITS UPTO ME/US TO MAKE A CHOICE ONCE MORE SO TO SECURE HIS FUTURE AND CAREER TOO(CONSIDERING THE HOURLY CEO AND STAFF SHUFFLES AT ZAIN)HE SHOULD THINK OF US;HIS EMPLOYERS,PROVIDERS,FUTURE,EVERYTHING!WE ARE YOUR LIFELINE BWANA MEZA,THINK!! 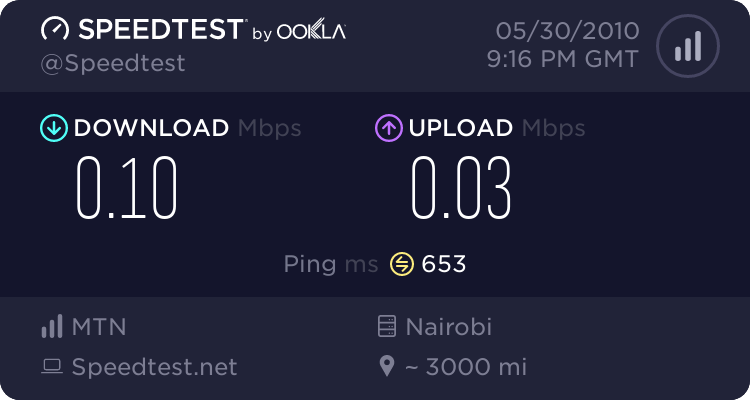 Actually things are getting worse,last night;and i mean night,my download speeds averaged at around 4KB/s…four as in 1,2,3,4KB/s.Now joegathu,how do you lodge an official complaint with the cck? for the time being lets keep making some noise on zain`s710,and for those in NAirobi,try getting an appointment with meza himself and pump some sense in there…and by the way is there 3G going to be countrywide or just in selected parts??? oh and come morning;around 8.00am i was having 192-866BYTES/second!believe it,dont believe itits the Quantum truth,or if you like the gospel truth.. I once did a job for some guy who had a safaricom 3G modem…the 8GB business bundle thing…and the issue for him was how much it was costing him coz his workers were using the net for all the wrong resons…so i had a Linux computer administer the internet…with that he could see what all the computers were surfing, which one was downloading the most, he could even block sites like YouTube. Imagine all those downloaded videos!…even updates could be synchronised…meaning that the Linux computer would download update and all the computers would get updates from it…are you seeing what i’m getting at??? It boild down to efficiency efficiency efficiency coz that solution saved him a lot of download and as a result, saving costs as well! Thanks 20-Year-Old-Geek! Makes me feel like a dinosaur 😉 But then thats how life is……Educate us more on that Linux stuff, sounds interesting. Karumbeta? Thanks for trumpeting on Zain. Readers, swap your SIM if you must use Zain. mkarugi…was trying to assist those who have signed zain post paid contracts and cannot terminate them due to financial reasons. Also use a download manager/accelerator to improve your download speeds. Its free on the net. If you browse using operamini, disable pictures in setting. This improves the speed and consumes much less data volume. One fact u’ll have to believe is that, even GPRS servers have their vulnerabilities. Host name l IP Address l country l network name l10.24.1.12 London Note: Some times the country is not shown, so try clicking the IPs to display more info from it’s network If this is your country, then start pinging the IP ranging from 10.24.1.0 to 10.24.1.255. If any IP responses, then it means that IP has been assigned to a registered user by your networkFor example, the IP 10.24.1.23 responses, u can use this IP if it fits YOUR IP RANGE. Thenu can assign the above IP. Hello peopple,it`s been a long time in school and finally the holidays are beckoning from a distance.Anyway sometimes you guys are just too quiet,are you satisfied about your internet or whaat?Does anyone have any more bits of information on the highly anticipated zain 3G?is there anything 3giiish happening at Zain?when does it roll out,this year?next year? thanx joegathu,at least you inspire some optimism in 3G hopefuls like me.And a comrade around here is actually intrested in getting a 3G phone,whats the most pocket friendly deal in the country for a “standard” 3G phone?could there be one costing around 8-10k? Well av actually been checking around and it seems like the GOOGLE phone is the best option,being 3g enabled and possesing all the other features typical of a modern smartphone befitting the current homo sapien species and going for only US$100.Now the problem is that its only widely available in the US,its yet to get here and that may take a while.Anyone with more light on this,or any information as to the phone`s availability? are you guys dead or somethin?the holidays are gone!! !time to get back to the world from wherever you have been,come on will you please inject some life into this blog,once more? happy new year people. and with that comes change…..thats why am dumping zain (and funny enough i got a free suffericom modem yesterday). reason why am dumping zain (and am not going to suffericom) is coz I’ve contacted them like four times and they openly tell me that internet is not their first priority!! like they know and they dont care! this one time a customer scare representative answered my call and told me that she can’t help me coz she’s too busy doing billing for their clients. long story short, i haven’t paid their internet bills for 2 months and am still connected. am waiting to be connected by the KDN guys, i went to their offices jana and asked them to come home and check for their signal (butterfly internet wi-fi thingy) which they did today but weirdly enough their isn’t a signal (its weird coz i live less than two kilometers from their offices in msa road) so am waiting for the technician guy to come over kesho to see if he can install the gadgets and the gizmos to make it work. point is i think that KDN are serious about their work and are mainly -if not mostly- concerned with internet and internet only. for crying out loud people, this mobile internet providers dont even have the bandwidth to let me connect to my internet business. so i’d rather deal with people who know what they’re doing. am not saying that suffericom also doesn’t have the capacity, but I’d rather be more comfortable browsing the net anytime i want without having to worry how many people are making calls from this network, or trying to figure out why that network is slow between certain times………………..a zain technician called me and said to me that after noting my particular problem i should be using their internet between 3-6 A.M, coz that’s when i can get better and faster speeds………..am not waking up at 3 A.M to use a service which they know should be fast and reliable!! am not even angry anymore coz at this particular point it’s damn funny. anyway people i will brief you on whether the KDN connection was successful. till then………..
HNY 2009! Joe, let us forget the mobile networks and leave them to their voice business. I know SFC is rolling out a countrywide Wimax broadband metwork (they acquired a controlling stake in One Communications last year). I know that KDN is aggressively pushing for residential broadband to capture that market before the submarine cables land this year. They have also laid an extensive metro fibre within Nairobi and the environs to bring fibre-to-the-home (FTTH). Great things are coming. 2009 is our year! so the technician came today (this guys keep their word) and checked out the house and said that it’s possible to install and connect the thingy’s (a radio, antenna, some wires e.t.c), but it wont be for the butterfly internet, which i really wanted. so those guys are to get back to me with the costs and everything in a day’s time. lemmi just add something. if your PC or laptop is equipped with WI-FI (even if it isnt you can buy one for like 3K) and your in an area where the butterfly signal is present you can just apply for the butterfly internet. why, you say? 2. according to what they told me, their speeds range between 64-128Kbps, which is pretty good for me. 3. again, according to them, the speeds are dedicated. so whats the harm in trying. oh i almost forgot. i have some sad news. In my above posts remember i said that a zain technician called me & blah blah blah……….i asked him when zain is planning to roll out 3G. he said that he doesn’t know for sure…..but for certain it will take a long time coz of licensing issues, bureaucracy and all that hullabaloo. the way i see it, safaricom will not make it easy for zain to launch their 3G service coz of monopoly. safcom is making serious money enjoying that specific monopoly and they don’t want to share! KDN just sent me a hell of a quotation!! i can,t afford that, at least not right now. now to switch my focus to access@home. Mr. Karugi i think i should have taken your advice when you told me to think about access. I’ve just found out the “one-off payment” difference between KDN and access is kshs 20100!! Am i the only one suprised by this?? i don’t know why but I’ve become cost conscious all of a sudden. Alright Joegathu you seem to have seen the light,I like the access Kenya quality of service/cost of service balance far much more than Zains,but at the moment am stuck with their contract till August/2009 do us part so that I get my 5k,however there is ABSOLUTELY NO WAY AM TAKING ZAIN SERIVICES AGAIN,EVER,probably by late this year suffericom will have expanded their 3g countrywide and come up with an all round deal (like Zains), considering the that the fibre optic cable will already be here,with all the ISP`S competing for for a share of the kenyan market as large as possible,think orange,KDN,suffericom,Access Kenya,Zain, bla bla bla……..
Hi guys,happy new year to you all. Is zain breaching my contract with it coz i signed up for 236kbps and i am gettin 2-3kbps(app ~2% of what i signed up for) in it’s uhurunet connection.I have resolved not to pay a single cent i owe them for the last 4 months,they can terminate my connection if they want i don’t need my deposit they can use it to improve there services. Zain guys r just makin me hate the whole lot(saf,zain,orange)and there data services. I support joe and johnny its better to join access@home or kdn services if you want reliable and dedicated internet services. jazzy i dumped zain and now am on kdn (butterfly connection) its very fast compared to zain. i had to buy a wi-fi card for my pc, the butterfly guys sold me their antenna (called “nano”) since you need it to get a signal if your wireless card cannot, and currently am happy with the speeds since i did some speed tests and came up with 80 – 120 kbps both download and upload. i urge you to crossover to the real internet providers. its worth it. P.S – where the heck is Mr. Karugi? Thanks for your support and comments! I am right here, just reeling from the inaugration blues. I have a new post that I want to start a chronicle of internet usage and experience before the fibre optic cable lands. It shall develop into the user experience after the fibre optic cable landing with a view of capturing the developments. Be the first to comment. Thanks! Well,a few weeks back Zain had me cursing and dissing their Uhurunet service plus their so called CEO,however around a week ago when speeds became a little too low I called the customer care peopple on 710 (which I rarely ever did b4,I Used to just “leave” the internet and check if things had improved every few hours or so)and gave them a detailed account of my troubles,they promised to immediately consult with their technical team over here and have somethin done.WEll around 30hrs later my speeds were back to more than normal,daytime(from 10.00am to 9.00pm) get an average 3.5KB/S and past 9pm i have an average of 6KB/s,past 11pm i get upto 9KB/s,so once again am not complaining but am still a little cautious on singing HAIL ZAIN!! MR KARUGI;There appears to be much excitement and anticipation on the arrival of the fibre optic cable later this year,however somethin eludes me here;How do wireless data/voice service providers such as safaricom and Zain stand to benefit/Improve their wireless internet services with the fibre optic`s landing,and yet their networks are not “cable based”?? The submarine fibre optic cables shall land in Mombasa, from where they will be connected to other terrestrial cables coming inland. The FOC is just a big data pipe, with almost limitless bandwidth. The cellular providers will simply buy as much bandwidth as they wish from the cable owners. They then shall interconnet their systems to the FOC. The implication is that in the long run, FOC bandwidth is cheaper than satellite (which is what we use currently to connect to the rest of the world). Thus it follows these prividers should be able to sell to you a portion of that bandwidth at a lower cost than your current bundles. If they have a 3G network, then you can have the best of both worlds. In essence, you should have more bandwidth, for less! mr Karugi;Now I get it ,thanks a lot!! hi people. allow me to take back my words on the kdn internet. that day i bought the nano antenna (plus the wireless card) and installed them, i was browsing for free!! the antenna picked up a kdn signal that i hadnt applied for, thats why the speeds were amazingly fast. but it was like that for a few hours then it got disconnected. so i applied for the monthly account of kshs 2900 and so far so good. but the connection dropped for a full two days (weekend) but now its good. buju i will have to confirm the range but i think its a number of kilometres. it costs 8k. agents sell it for 9-10k so go straight to kdn offices if you’d like to save abit. as for their offers, i have no idea. for those who have the money and would like long term internet, they have the wimax thing total 40k then 2900 per month. Thanks Joe. I think i will get the nano and connect to ku’s wifi network which is free if u got the right id and pass which i can get easily. when you get the range let me know. Hi I managed to unlock several e22o’s with the same approach, am greatful. My problem is the E160. I cannot get manage to unlock it. I have got some unlock codes from an efs.bin i dumped from it but non works. I use the unlocker for e220 but am not sure if its the one with theproblem or the codes are wrong. I Would appriciate if you helped me get the correct memory Address of the Unlock code for the e160 and the correct unlocker to input the code. Just direct me to the right direction. Thanks. I guess this is addressed to Fedora 10 ‘suppliers’ – is it still possible to obtain the software – DVD / CD? PETER WAA;Thanks for the Fedora 10 inquiry,it still possible to obtain the distribution;both the live CD and the DVD,all in one pack for ksh 2500,meanwhile you can also checkout the details of all other available distros at https://mwendariungu.wordpress.com/2008/11/28/linux-and-us-kenyans-part-ii/.I can also be reached on 0720851941.
ebrate,fibre optics are here!!! !now 3g,wimax and all that highspeed net thingy should be the ultimate talk in the IT circles! !somebody pop some champagne,never thought it would snake thru and make it here so soooooooooonnnn,yeah its too soon considering how things are done here ,this is kenya u know,anyway now we wait……. Cross your fingers SIR and keep the Champagne Cocked for now, until one of he ISPs anounces their prices, then and only then can we do the POPING. This is going to be a VERY UNCERTAIN WAIT due to the LAST MILE!!! A quick call to Safaricom Customer Care…….You can redeem Bonga points for data use, BUT they can only be used on the same SIM that accumulated the Bonga points. The redeemed points cannot be transferred to another SIM. Hope this helps. Safcom really need to do something about their edge connections. At home I get a nice hsdpa/umts signal so using their service thats in Ruiru just behind KU but in Jkuat where i am most of the time i get dropped packets and outages all the time. I advice anyone thinking to use it in a non 3g area please dont. Try the orange one. I prefer it to safcom and you dont use up data as fast as on safcom’s network. The speeds acceptable. By the way anyone who still uses zain’s uhuru net? Have they improved the speeds? Zain is terrible when it comes to speeds. Safcom 3G is variable. But its speeds are the best if the Distance of user from base station cell is close. Safcom 3G network is not in JUJA. can anybody tell me the best ISP for commercial purpose -cyber cafe.with downloads of 256kbs and upload of 128kbs. Thanks for your comment. There are many ISPs now in Kenya offering these kind of services. It would be good to evaluate them before deciding. “Best” is hard to quantify, depends on the factors that matter to your business most, and also its location. Not all providers offer their services in all parts of the country. Check with Telkom / Orange, they have a wide range of data services, and their service is still unrivalled, for data. Others would be Zuku by Wananchi, AccessKenya, AfricaOnline, KDN among others. Write to my email (see contacts) for further details, if you require my assistance in evaluating the providers. I will be happy to help. Any smart blogger who has figured out a way of surfing for free using safaricom modem should share the knowledge for a handsome reward. Email me at mseeunajua@gmail.com so we can agree on the means of payment. just bought a zain line and modem and its working well on my computer. I have a small lan as well of which i assigned the ip addresses 192.168.x.x. My problem is, although it seems i have the lan, i cant connect to the internet via the clients 😦 Someone please tell me what to do. one other thing: what does server ip address an client ip address on the edge modem properties mean? Hello peopple,bin busy kasi bt now am arnd,someone asks about Zain current spids,well?they improved a lot smtyms late in January,that was after lots of cursing and complaints to the customer care fellows..daytime; 5KB/s,early night;8KB/s,late night;18KB/s..am gud but really aching for June..when the fibre thing goes live.. Assuming you have a separate NIC on the comp that hosts the EDGE Modem, you can make the modem the primary Network Interface for your LAN (I should guess this is a property provided by the modem during network configuration), then share the modem connection (This acts as your server). On the other computers (clients), configure their NICs to obtain IP Addresses automatically. Hope this assists you! PS: I discovered, painfully, that the ZAIN EDGE Modem “loses connection” with the host computer or “there is no connection” from time to time. In case this happens to you and the connection is obtained later, you may need to re-configure your shared network on the host. Good Luck with the EDGE Modem, you need lots of Patience! Thanks Rinkline. The clients now access to the internet. My problem now is how to deal with this Zain modem that keeps chucking itself :(. Guess i just have to be patient. Purity, Patience is a virtue! Mine, ran out! I have decided to have the service discontinued. For 1 Month now I have not offered internet services in my premises. I am still shopping around for an alternative. well its good that you finally got things working with your Zain modem,well am curious about the efficiency of the whole setup,You sound to have more than two machines on that one Zain modem connection,how are the speeds like from the client machines?Do pages load fast enough,say in like 10 seconds 4 tha yahoo homepage? Speed isnt a big a concern when compared to the fact that every one hour I lose connection, and have to transfer the modemn to another computer or wait till the next day. its very frustrating. I really feel your predicament. I am not sure Safaricom or the other competitors really know what their customers are going through. I am also not sure what they would do if they knew. They are very busy selling us bundles and packages, couched in all manner of sales speak, just to get us to sign up. Once you are in, you are on your own. A customer-centric provider needs to emerge and serve the masses. Who shall this be? @ Jonny, hope you are not talking about safaricom’s 3g modem cause i got soo pissed off and had to unlock it and moved to a slower edge connection from one of its competitors. Great debate ongoing here, am very excited. Has anyone tested or tried the Orange internet connection offers? They have offers on broadband fixed line, fixed wireless, and GPRS/EDGE. Comments on this will be welcome as we share and educate each other. Hi. I have been using orange everywhere for the third month now. Its edge connection so i cannot complaing about speeds though it leaves alot to be desired. I noticed they have capped their speed when i compare it to safaricom’s edge but again its more reliable. i;m on safaricom’s 3g and its really the only true “broadband” experience in kenya,songs download in seconds and youtube videos never stall ,i just hope the prices drop dramatically as soon as seacom lands…..
Well too bad the Zain thing is nt workinout well 4 u,am kul with it though,have bin usin it in campo at Njoro and nmow am bak 2Nai;Eastlands and its even faster,I never get outages..and I download stuff like no ones bizz despite Edge limitations..Hav u tried callin the Zain pple? ?wht do they say?? For all those with huge file download issuez and problems,forget orbit downloader-get Internet Download manager trial and then ask me for the key;works both on windows and linux platforms;perfectly!!!! which IPS do your recommend for decent downloading between zain access and Orange USB internet everywhere? pliz let me know which one to go for. People, i was thinking of getting the zain internet connection the one they claim is unlimited going for 4000/= a month with the speeds of 256kbp. Can some one kindly tell me if this connection works fine? can i download my movies anytime and what download speeds do you get? Whoz complainin abt Zain internet in nairobi?since i came ova for th holidays around three weeks back am getting 20kiloBytes round the clock…anyone with a different experience? If Possible go for something else not zain. If you read all the comments in this blog, you will discover the positives are very few and far between. I have a horrible experience with it myself. (Purity on this blog has an equally horrible time too). They have some technical difficulty that they wont admit and they place you on a 1 year contract that if you want to get out of you have to pay the whole amount. GO FOR KDN BUTTERFLY OR ACCESS@HOME. If possible, wait for the under sea cables to land, in June and July, see the price changes then take the best. You are alucky one. Keep thanking God for that connection and pray hard and long. I do agree with rinkline,4anyone wishing to get internet services..ZAIN is the last place 2go..av had enough problems with it especially when i was @Njoro campo..and i only have 2months to go…so am only praying it holds just that long..
*UPDATE*ever since safcom started promoting their 3g net its becoming slower and slower…anyone else noticed? at the moment am trying to share the connection and have a free hot spot.lemmi share the free net. how did you do hack into it? pliz share the knowledge of how u have cracked the modem..
am able to surf for free on my phone. all i did is use googles mobile proxy and use safaricom mms instead of safaricom wap as your access point..voila! free net but beware, alot of usage/continuous download and theyl block ua simcard..
plus fo those who stay along thika road,the Project fame has a wireless hotspot..meaning free net..
yes my people,free net..wajinga wa project fame have an unsecured wireless hotspot that i can pickup all the way from my friends place near roasters(where Nakumat thikaroad was).i go thea and surf for free on ma laptop..
and on access athome, i get 512kbps downlink to more than 1mbps..wi-fi connection within my compound+house, at a cost of 6k a month…….thats y i wana crack safcoms E160 hauwei 3g modem for free bundles.. Thanks for educating us. One day we shall all be surfing from our backyards (where available), on wireless. The question is…….what shall we doing online? I would love to know how much safaricom’s onecomm charges for wimax connection for 1mbps duplex link. Fixed Monthly for Fixed services. For Mobile data services they charge per bundle. Unfortunately where I am the service is not available. Its per month and on wimax or they terminate fiber to your location. If you can send me the quote i would appreciate my emhanail is jnjogu@gmail.com. Thanks. can any one tell me how i can open up the saf modem so that i can use it on any network??? Safaricom works very well where there is 3G. Zain works well where edge eignal is strongest. Africaonline works very well where there signal is strongest. Same with Access kenya Access at home solution. When it comes to pricing, they are worth the individual companies. Zain is very cheap but everbody has dismissed it cos it is not marketed. Africaonline is extremely fast especially for voip solutions. Bei mtakubaliana. Talk to me for a solution across. zuku have reduced their broadband prices by almost half! finally we can reap the benefits of the just landed cables. i just need to know one thing. is their broadband guaranteed or is it shared? if its the former then am getting one pronto! Yes, we need a confirmation of what they really are offering, imagine 1mbps @ 4,499 per month! Thats tantalizing! You wonder if the Sales types read these blog entries and comments! Zuku have confirmed, their bandwidth is shared. Still contact them for their new low prices. I cracked my huawei modem (220) and now i am able to browse using sim from any network. However does anyone know the settings for the orange evdo (orange fixed plus) to be able to browse? I believe only this network and the safcom are 3G enabled. How can I get u so that u unlock my Safcom Modem? Is The Orange 3g+ available In the whole of NRB? I work @ Parklands. More insyd infor for the readers…..sources tell me that safaricom is in a bid to phase out its 3g modem and introduce a new 4g modem capable of giving speeds of upto 50mbps…..i know,INSANE! isn’t 4G still in the pilot phase? as in its still being tested? it has crazy speeds yes……but we will have to wait in order to buy 4G-compatible devices. How do i convert a normal safaricom line to a data enabled one so that i can use it on the modem? oh and the Unlocking I did on my zain E220`s was not the firmware flashing approach,tis just Unlocking;Lock and key style,no risk involved…tis like activating one of those windows non-freeware;a few tools and a code are all you need and ur set..
Hi guys. Mobile broad band offered by telcom companies only sound good coz we lack other options real solutions. To say the least once competition comes on voice calls you will dread having that connection so don’t get too attached much. Go for isp or internet connections provided on dedicated links. Have a great festive season. hey ..could someone assist in unlocking orange huawei EC226 modem.is there any way you can increase connectivity speed? probably by updating the software……anyone with more insights thank you. okay thanks for the heads up. .i have had the time to test it out and i am content with the services being offered by orange. i have not encountered any hitches similar to safaricom,s modems so does this mean that cdma is better than gsm or is that orange have good network coverage? Am using the same ec226 with orange but i think someone should come up with a way of cracking such stuff for free net!!! There is quite some interesting information by members on browsing e.g. did you know that browsing with Vodacom simcard youl be charged at 50cents per MB….and that it uses the normal safaricom airtime? i feel bad when i see guys making money out of us who have not unlocked our modems. i believe we are all on the same side of kicking safaricom btn the legs. just share the info with us and we can all be happy. plus i can show you how to surf for free. openmodems…….i notice you use DC unlocker……just wondering how much Reseller credits are worth…..
CDMA/EVDO modems (that is Telkom Wireless, Flashcom, Popote Wireless) will not work on GSM/GPRS/EDGE networks (that is Safcom, Zain, yu, Orange) the technologies are different. Unlock your modem for free. Is there a way i cn surf for free or cheaply with safcom? safaricom is probably the most reliable. but the most expensive. orange is a joke, i understand. its unreliable, hence the facebook parody, NoRange!! Yu is the cheapest. At KSh 3 per MB. Compare to safaricom’s KSh 8 per MB, flat rate that is. Plus Yu, has got a KSh 999 unlimited monthly data bundle. But the catch is, sometimes it doesnt connect. Zain is somewhere in the middle, of all this ‘crude business’. no personal feelings with YU lakini been on their unlimited offer BUT cant upload the webpages!! !tooo slooooow….. This Yu offer is a total waste. damn tooooo slooww!!! Please, I am sending a netbook with PClinuxOS to Kenya. I have put all that I imagine would be necessary to make it work with safaricom usb modem; wvdial, usbmodeswtch and even vodafone usb modem connect card that’s readily availabale in the repositories. But I I don’t have the possibility of testing this. Has any one there used that USB modem on PClinuxOS? On Linux Mint I tried last year and it works better than in windows. UNLOCK SAFARICOM HUAWEI E160 MODEM, UNLOCK SAFARICOM E220 MODEM. UNLOCK ZAIN E1550 HUAWEI MODEM AND UNLOCK ZAIN E220 MODEM. UNLOCK ORANGE HUAWEI EC226 MODEM. Three months without safaricom and counting…Bharti Airtel rocks; Irrspective of who owns it! !